Looking for a double pram was extremely stressful and overwhelming to say the least. 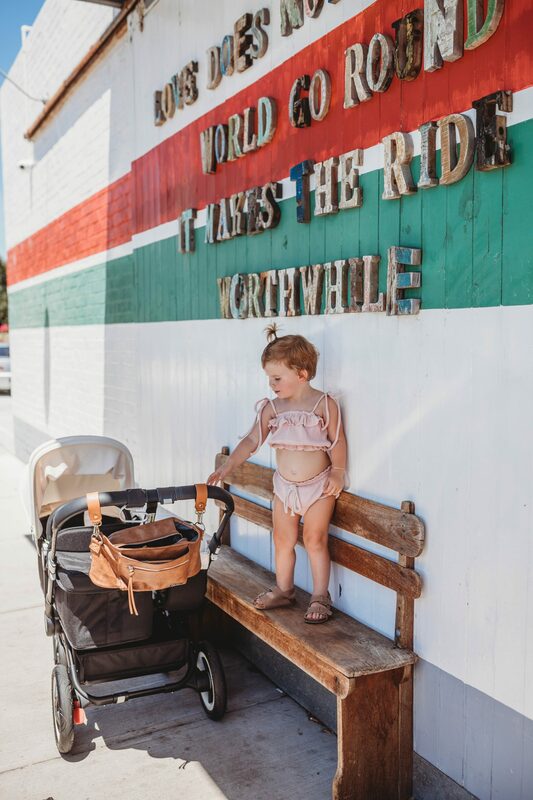 Alaska is super tall so I was starting to think, maybe we didn’t need a double pram, maybe she could just sit/stand on an additional skateboard attachment. BUT Alaska has only just turned two and she LOVES being in her pram. She still falls asleep if we are out during her nap time and would prefer to be pushed around than walk! (channeling her inner queen!). We went with the Bugaboo Donkey 2 Duo in black and cream. All my reasons for this decision are below. 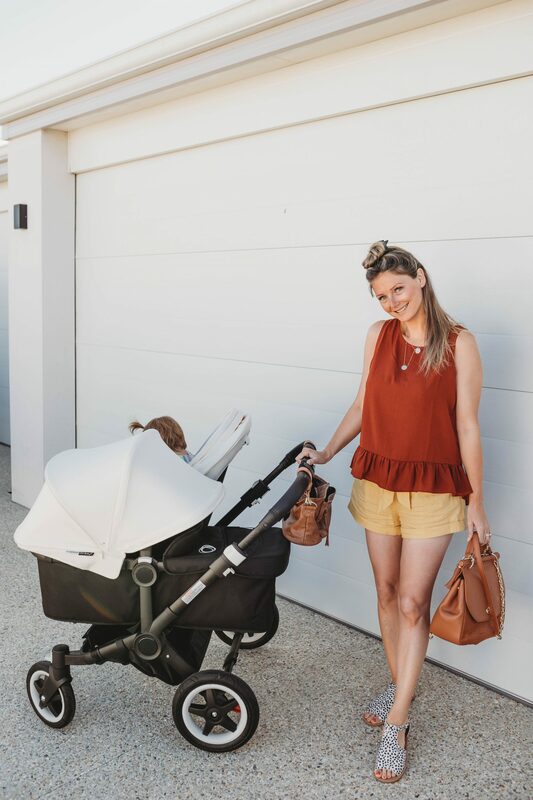 I was seriously so happy to partner with Bugaboo, I have been able to test out this pram for the past three months and I can truly say I. LOVE. IT! I really can’t recommend this enough! You MUST go into a baby store several times and try out all the prams before you commit to buying. Not just once or twice, GO IN LOTS! You will potentially have this pram for years to come so you need to make sure you LOVE it before you take it home. Don’t be afraid to spend hours in store at one time pushing them all around the isles, changing the seats over, putting your toddlers in each one, it will really help you decide which one will suit you. We went into Baby Road several times for their pram demos and researched our butts off. We also received hundreds of messages from you all with your pros and cons for the prams you all have. I felt like my head was literally going to explode, what if I made the wrong decision? It wasn’t until I saw the Bugaboo Donkey in person next to the other double prams that I was able to make my decision. 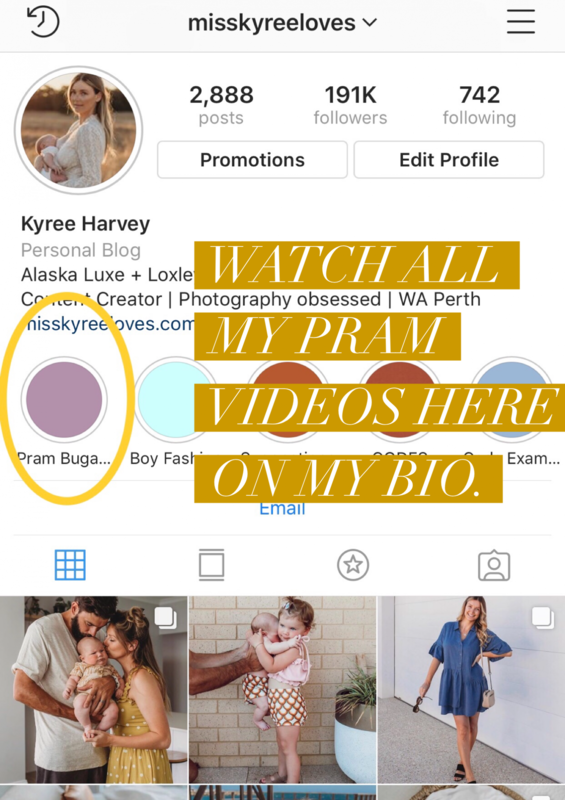 Head to @misskyreeloves – Watch the “PRAM” highlight to see videos of our little family using this pram in our real, every day life. You can see how Alaska and Loxley look in both seats/ bassinet. You can see how compact it is in both modes. There’s also a video showing the comparison between the Donkey and a regular single pram. I didn’t like the prams that the seats were above/below each other, the seats needed to be side by side. Our Joolz was the below/ above configuration, I thought at the time I’d be happy with that if and when we had baby #2. But after actually having our daughter and knowing what she is like, I wish I’d gone the side by side from day one. I knew Alaska would hate sitting below or above the new baby as she’s not big on change. We tried her in the prams in store and she HATED this style. A new baby is such a huge change as it is and I wanted her to be as comfortable as she normally is. Knowing we could convert it down to a single and have the option of a skateboard attachment added to the versatility. She loves leaning over into the bassinet and holding Loxleys hand or just seeing him next to her. I wanted a pram side by side, but hated the thought of having a PERMANENT enormous double monster wheeling around all the time. The pram needed to convert down to a SINGLE pram for the times I only have baby with me, or when we didn’t need the double in action. We had our last pram for two years, so this new pram will remain for additional siblings. 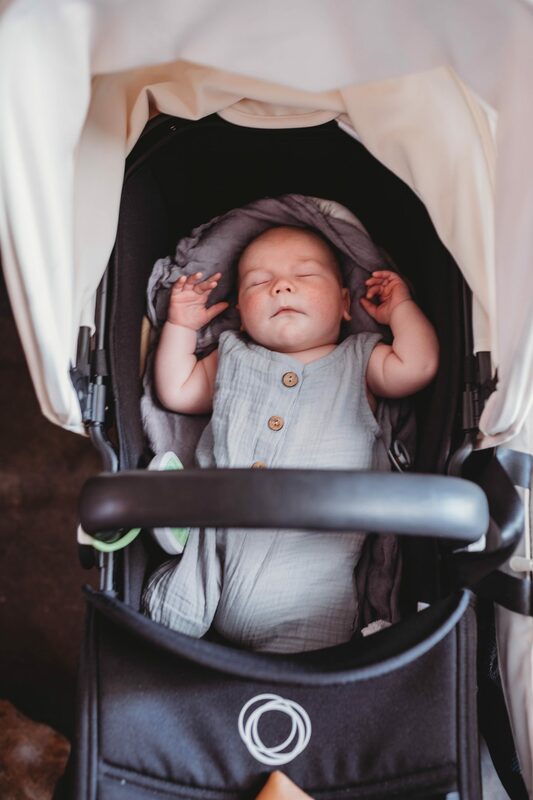 Alaska will eventually not need to sit/ sleep in the pram so having the option of converting down to a single means it will be far more versatile. 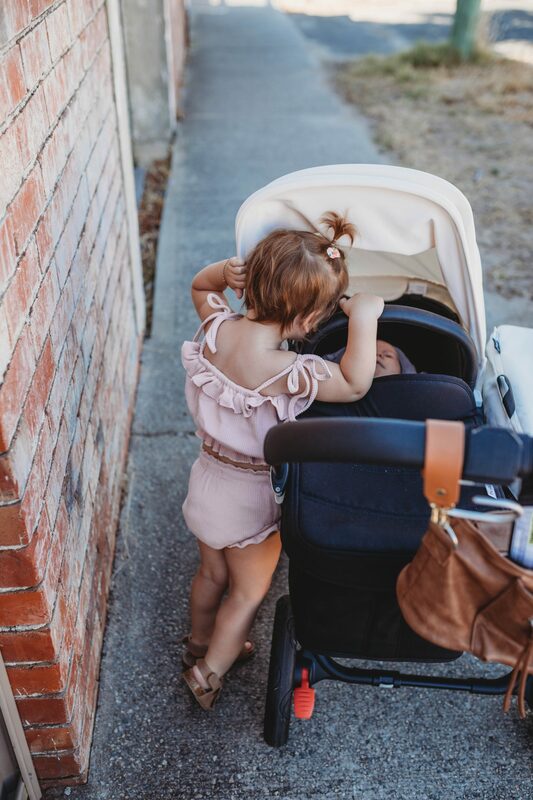 I spoke to several friends (who knew buying a pram was such an intense life decision) they all agreed double prams were a life saver. Some have the above/ below layout and love them as it means they can get into more spaces etc BUT still said it’s difficult to go in and out of shops regardless of it being the narrow double option. One recently bought another side by side pram, but wishes she spent the extra money to get the bugaboo Donkey as she hardly uses her double . She actually now has THREE prams stashed in her boot because sometimes she only needs the single pram. This is what sold the Bugaboo Donkey for me after hearing this. The sunshade length was a winner too! The Joolz just didn’t have enough sun shade cover and being a summer baby we always had to put a swaddle over the top to ensure she was covered enough. You can fit through door ways fine. It’s really not that much wider, I have been able to fit through every door to date with no issue. Storage is great. In single mode you have the under basket plus the side basket. I usually put nappies, lunch box, my water bottle etc in the side basket instead of taking a baby bag. But you can still fit a bag underneath too. In double mode I have a hook that’s attached to the handle which I attach my shopping bags to plus I have an attachable caddy bag that hanging swell. It folds down in parts and fits easily into our boot. Takes up half of the boot once packed properly. You have to take it apart to put it into the car but this is easy to do. Just means you have to put the seats onto the floor while you’re taking it apart. It’s extremely easy to manoeuvre. I’m often wheeling it in double mode one handed and holding Loxley, it’s super light weight to push around. Super easy to take apart and put together myself. Lifting the chase/ base/ wheels is a bit of an effort but it’s not that much heavier than our previous pram. It all clicks into place easily. Justify the cost- I use it every day no matter where we go. Either in single or double mode, it still comes with us. 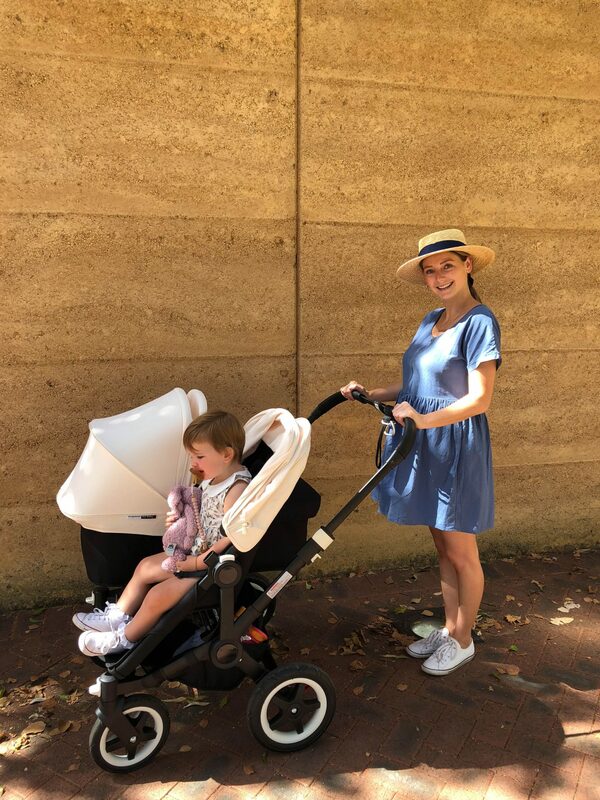 Postpartum recovery – I was lucky to have Ben home for four weeks after Loxley was born so I didn’t have to lift the pram. But I’ve been using it since four weeks on my own and love it. Honestly don’t have an issue with the weight in and out of the car. The price scares a lot of people. But I guess if you divide the cost over how many years you’ll be using it with multiple children, then it’s an investment. Plus Bugaboos hold their value well if you want to sell it on Gumtree when you’re done with it! The under basket can be a pain to use when in double mode. But I use my caddy more so because of this. We had our last one for two years and Alaska loves it! This blog is in no way sponsored. 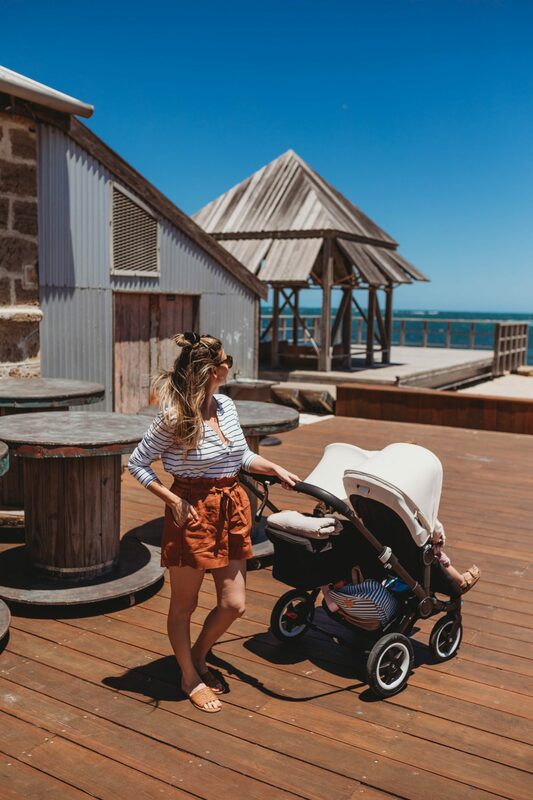 Bugaboo provided us with this pram in exchange for a professional collaboration with Miss Kyree Loves. This is an honest review based on our experience using it over the past three months. All words, images, creativity & thoughts are completely my own. Next Post Valentines Day Gift Guide. Send This List To The Love Of Your Life!